Hale Lea Family Medicine & Urgent Care is a walk in medical clinic. Serving Kauai’s North Shore and Eastside communities, the clinic has earned the trust and confidence of the local community and its visitors for nearly three decades. 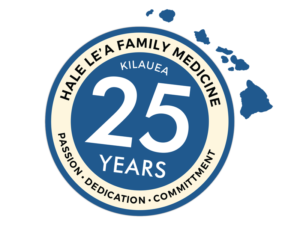 Hale Lea is the longest standing clinic on Kauai’s North Shore, conveniently located in Kilauea, Kauai, close to Princeville and a short drive from Kapaa, Anahola, Hanalei, and Haena. Hale Lea Medicine and Urgent Care provides the full scope of adult, pediatric and senior health care. The medical center provides both primary care (long term, ongoing, chronic) and urgent care (same day) services – all under one roof. Medical services include treatment of minor emergencies like infections, asthma, headaches, lacerations and other injuries to long term chronic diseases. Hale Lea is fully integrated with Wilcox Health physicians and Wilcox Memorial Hospital services. Laboratory services and physical therapy department are available on site. Hale Le’a accepts most forms of insurance. Providers specializing in Family Practice, Emergency Medicine, Urgent Care, Preventive and Integrative Medicine, as well as a Licensed Clinical Social Worker, Psychologist, Nutritionist and Physical Therapists. The medical center provides both primary care and urgent care services all under one roof. Hale Lea Medicine provides the full scope of family practice medicine, treating all forms of chronic and acute illness and injury, including pediatric, geriatric and adult medicine services. The partnership between the community and Hale Le'a is the hallmark of a sustainable healthcare model. Integrative medicine is an approach to care that puts the patient at the center and addresses the full range of physical, emotional, mental, social, spiritual, and environmental influences that affect a person’s health. Our highly-trained therapists offer extremely effective treatments for all types of injuries, chronic musculoskeletal pain, post-operative rehab, workers compensation and motor vehicle injuries. As a non-profit healthcare organization, Hale Le’a is sustained by the support of community volunteers and donors. Hale Lea Medicine and Urgent Care is located at 2460 Oka Street in the same building as the North Shore Pharmacy, the only full service pharmacy in Kilauea. Convenient parking is available.